The Under Armour Curry 2.5 never set out to be an ‘elite’ version of its predecessor, the Curry 2. Instead, the Curry 2.5 takes familiar features from the Curry 2 and pairs them with new and “improved” features to give us a different take on what was already a stellar on-court performer. Will the Under Armour Curry 2.5 be enough to hold us off until the next chapter of Steph Curry’s signature line is revealed? 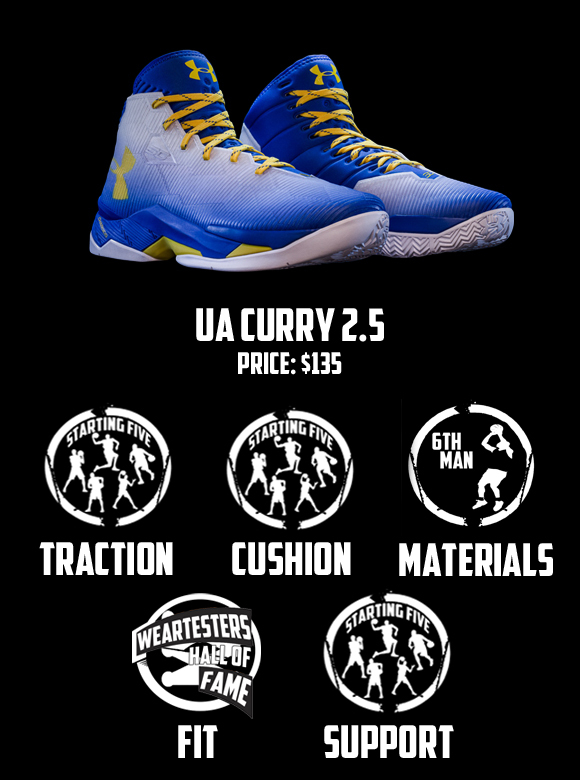 Find out with the WearTesters Under Armour Curry 2.5 performance review. Damn Jahron, you even played like Curry in the video, lol. First time watching you but great review nonetheless! What programs and camera did you use? And especially, what is the weight of the shoe? I’ve heard this shoe is slightly heavier than the curry 2, is that true? It’s the best traction on a current basketball sneaker. Does the stabbing in the heel aver go away or break in? I picked these shoes up two days ago and I love them except for the fact that I have two blisters on both of my heels now. I am considering exchanging for the 2’s but I would def keep them if the stabbing will eventually go away. Just got some and have this same issue of blisters. Did it go away for you? Thanks for being one of the first reviewers to ACTUALLY REVIEWED THIS SHOE! Everyone else has said that they would not pick it up because it would be exactly like the Curry 2. Anyway, nice review and I will look into these. I dont know if its just my shoe or the compounds used in the 73-9 BY CHANCE but my traction is less than great. I know it’s the same as the curry 2, but it just feels so different. I had no trouble with cutting motions when i played in the 2’s but when i try in the 2.5 I almost end up hurting myself. And for reference i play on the same LA Fit court that I do with all my other shoes. How can I get rid of the stabbimg lain in my Achilles without having to wear an ankle brace? I know there is a way because I found it on a website, but it got deleted.